James I. asks: I was at Lowes and noticed mailboxes say “approved by the postmaster general”. What specifications do a mailbox need to reach to be approved in this way? I mean, it’s a box with a little door and a flag. Are those the requirements? What’s the process here? Thanks! While the United States Postal Service (USPS) and the position of Postmaster General date back to the American Revolutionary War, the USPS didn’t start regulating the size of mailboxes until it began delivering mail to residents in rural areas of the country. The new program, known as rural free delivery (RFD), started in 1896 as an experiment to determine whether delivering mail to residents outside the city was practical. As of 1890, the more than 65 million Americans living in rural areas had to visit a post office to pick up their mail while those living in cities had their mail delivered right to their homes. The fact that the service to rural areas was only a trial run meant that a numbers of rural residents refused to purchase a special mailbox. So instead, they used all sorts of containers found around the home such as cigar boxes, salvaged items, and feed boxes. Those makeshift mailboxes weren’t all that secure, and they often left the letters and packages vulnerable to being damaged by the weather. The Postmaster General tasked a committee to solve this problem in 1901, and the committee came up with the first specifications for a rural mailbox. 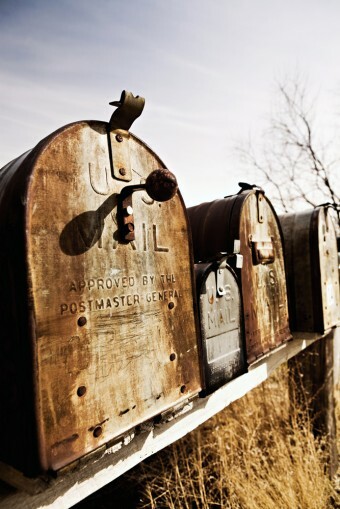 Mailboxes needed to meet the new rules when the USPS began a new route or if an old mailbox was being replaced. According to a USPS historian (Yes, they exist), the mailboxes had to conform to requirements for construction, size, and the height of the post on top of which the box sat. Specifically, the boxes were required to be made “of metal, galvanized iron, or steel with openings and hinges so constructed to be impervious to weather”. The mailbox needed to have an opening on the front or top and be “approximately 6 by 8 by 18 inches”. As for the mailbox post, the committee required that the post be tall enough that the postal carrier could deliver the mail without getting off his horse. The RFD became a permanent service in 1902, and the stamp “Approved by the Postmaster General” started to appear on commercially produced mailboxes so long as they met the specified requirements. The next official changes to the specifications of mailboxes came about in 1915. Given the aforementioned size requirements, rural mailboxes could only hold small packages. Initially, this wasn’t a problem as mail carriers were only allowed to deliver packages weighing less than four pounds. But the introduction of Parcel Post in 1913, a program that sought to deliver larger packages to rural customers, meant that the USPS and Postmaster General needed to come up with new mailbox specifications to handle the larger packages. As such, the USPS created two boxes, the No. 1 and the larger No. 2 box. The No. 1 box closely resembled already approved boxes, measuring 18.5” by 6.5” by 7.5”. The No. 2 box was designed to accommodate larger packages, measuring 23.5” by 11” by 14”. These boxes needed to have a tunnel-like shape, what has become the traditional style today. In 1954, the USPS and the Postmaster General introduced a third mailbox that functioned as a size in-between the No. 1 and No. 2 boxes, appropriately called the No. 1A. That change to the regulation was the last to require a tunnel-like shape. The option for a customer to construct their own mailbox so long as it fell within the minimum and maximum size requirements, as well as the introduction of the contemporary box design, were enacted in the late 1950s and early 1960s. Today’s mailboxes still need to comply with USPS specifications, but those rules are much less strict than they were at the beginning of rural delivery. Today, mailboxes must be between 18 9/16 and 2213/16 inches long, 61/4 and 11 inches wide, and 6 to 15 inches tall, and the mailboxes must be able to hold a test gauge. The boxes can still be constructed by customers, but the Postmaster General and the USPS suggests that plans for new mailboxes be shown to local postmasters for approval prior to construction. These rules went into effect in 2001. As for manufacturers getting a stamp of approval, mailboxes produced commercially can be inspected by the USPS at any point during the manufacturing process in order to ensure compliance with the Postmaster General’s specifications. If the mailboxes fail to meet the requirements, then the USPS can suspend the Postmaster General’s approval of the design. Before 1992, regulations regarding the size of mailboxes in the United States only applied to mailboxes in rural areas. City mailboxes were never officially addressed in the Postmaster General’s regulations. Benjamin Franklin was appointed the first Postmaster General by the Continental Congress in 1775 and served for a year in that position.